Long-handled gardening tools are often limited to rake, hoe, and 3-pronged cultivator. But they simply cant tackle the wide range of gardening jobs properly. And there is an easier way to do the job. Are you looking for Interchangeable Power Tools? Clearly these gardening tools are specially designed for purpose as they work better than ordinary tools. So I was delighted. My cultivators are undoubtedly superior, and certainly very effective. And only one tool handle needed for all! They all belong to a versatile interchangeable tool system that's also highly mobile. And this is all good news for families and community gardeners as well as organic gardening professionals. Like a root with a branching tree the Multi-Change also known as Multi-Star system is organic in style. Easily portable, it reduces the dangers of long-handle clutter in the garden shed, or an unwieldy wheelbarrow around every turn to your allotment. You also get the versatility to add different handles. This makes one tool head suitable for different family members. Children's gardening tools are easily made. And the system extends to domestic tool heads such as brushes and shovels, as well as gutter cleaners and with telescopic handles for fruit pickers and tree loppers. With small gardening tools I have just one tool handle. But I can attach the smaller tool heads onto my longer handle for easy reach. Why Aren't All Gardening Tools Like This? Normally gardeners and most garden retailers compromise on their garden tool range because a wide range of garden tools can't be stored or stocked with handles on. But specialised Multi-Change tool heads are sold separately. Of course buying online gives you access to more gardening tools straight from warehouses. But I always find the interchangeable gardening tool heads described here to be exceptionally effective. Actually they've not been so easy to find in gardening stores. So I've taken the trouble to post some links on this page. Wolf Garten's experience goes back to 1922. In 2009 they were acquired by a United States competitor - MTD Modern Tool and Die Company - established in Cleveland Ohio in 1932 - now a multi-national in gardening tools. A 10 year guarantee means these tools have to be sturdy. The solid join is important to the success of Wolf Multi-Change. Solid, connection, easy release, clunk-click. The same push together connection is used throughout. The handle's rectangular slot ensures no twisting and the lock is solid - it behaves like a single piece. A simple push button easily releases the tool head from the handle. The 140cm Wolf (ZM14) corresponds with the more common length for long handled tools these days, but it only gives me a comfortable range of 83cm and a steeper working angle - OK for small borders. There's also a 100cm handle Wolf (ZM10) easier for children, (and a range of extra light tool heads of hard polymer). Several telescopic handles are made, the longest up to 4 metres, especially suited for Wolf tree loppers, pruners and saws, as well as for apple pickers... Elsewhere on this website I've mentioned Easi-Grip handles - the D shaped Wolf Auxillary handle (XOM) can be similarly attached to main handles for added grip. Multi-change handles can also be applied to Wolf domestic tools, brooms, yard brushes, shovels, window squeegees, ice scrapers... ... they are truly multi-purpose. These Multi-Change gardening tool heads are much better designed for gardening jobs. And this really matters. I work more quickly and efficiently, and so I save time. They feel less of an effort to use - indeed I seem to put the tools away again in no time at all. 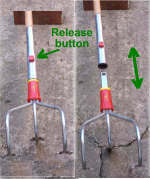 Right: Bow Rake (DOM 35) - 5cm wider than DRM 30 Soil Rake. Curved tines effectively lift earth & gravel, bury seed & remove debris & with a smoother out run. The Soil Miller combines oscillating hoe to lift soil & maintain depth, & spiked drum to break soil to a fine tilth. And it works very well, even on lumpy soil. The bright red and yellow was apparently chosen because it appeals to ladies. And no one can help but notice the gleaming quality of the metal finish. Made of steel with a zinc lacquer finish, they are hard, corrosion resistant and light. They can all be used with short or longer handles. For lot's more small gardening tools like these click here. To get the full advantage from an interchangeable garden tool system you need to ensure that your garden tools and handles are from the same tool system. Also note that tool heads are not normally sold with the handle. Range extends to domestic tools for the home inside and out.